The colourful, attention-grabbing new façade planned for the University of Florida (UF) Health Shands Children’s Hospital is courtesy of a new painted, stainless steel woven wire mesh introduced by HAVER & BOECKER. This innovative product provides an infinite array of colour and pattern options for building facades. For the past several years, University of Florida Health (UF Health), located in Gainesville, Fla., has been working toward consolidating pediatric services within the university medical center. 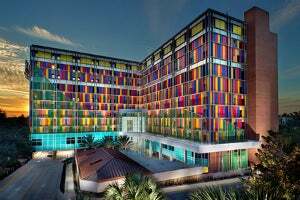 A planned renovation for the east entry atrium and building façade led the owners to realise it was time to establish a completely separate identity for the children’s hospital, which is, essentially, a hospital within a hospital on the UF Health campus. According to Bradley S. Pollitt, AIA and vice-president of facilities development at UF Health Shands Hospital, "The portal project is now rebranding the entrance to the building, so that our smallest patients do not have to enter through the adult hospital." Understanding that a hospital can feel ominous to a child, the owners asked the architectural firm Ponikvar and Associates to take an approach to the renovation that was child-friendly, while at the same time created a separate identity for the children’s hospital that would differentiate it from other areas of the facility. According to Jack Ponikvar, vice-president and principal architect at Ponikvar and Associates, "We were challenged to do something that was child-like without being childish." This differentiation demanded a dramatic change to the exterior of the building. Months of reviewing design options and product research led the architecture firm and the construction management firm, Ajax Building Corporation, to consider a light and colourful alternative to the somberness of the existing brick façade, with architectural wire mesh by HAVER & BOECKER. Made from architectural grade T316 stainless steel, the HAVER woven wire mesh product provided options not available with any other type of material. The colour selection allowed for a bright, multi-colour façade layered over the existing brick cladding, which would be appealing to young patients, while also establishing a new identity for the building. Additionally, creating coloured facades with woven wire mesh presents a multitude of unique design options. The interaction of artificial light, daylight, transparency, luminosity and colour ensures the stylistic effects of the façade change continually. The painted stainless steel wire mesh is incredibly durable, weather-resistant and virtually maintenance free. Bringing the visually striking design to life was not without its challenges. Designed to represent green, rolling hills, the outermost skin of the façade is made up of 26 MULTI-BARRETTE 8124 panels, which are painted green. These include 19, 85-foot long panels that diagonally slope approximately 19 feet over the span of the design. Supporting the mesh panels at the changing elevations to maintain the rolling hills visual provided a unique test for the installation team. However, overcoming the obstacles has proven worthwhile in the appearance of the finished product. HAVER & BOECKER produced sample panels for review by the owners, architecture firm and project managers. Using a crane, the sample panels were positioned in front of the existing façade to determine the visual effect that would be created once the coloured panels were in place. Ponkivar noted, "The use of colour with the woven wire mesh panels created a crystal jewel kind of feel." The woven wire mesh is manufactured to specification for each project. HAVER & BOECKER works with each architecture or design firm to bring individual inspirations to life. The product provides a play of light and shade, gloss and transparency that give each project its own unmistakable identity. Depending on the type and size of the mesh, the wire mesh surface can be transformed into a stylishly transparent or more opaque visual anti-glare surface. The LARGO-PLENUS 2022 weave pattern with a 25 percent open area was used for the Shands Children’s Hospital project. Says Pollitt said: "We did not want to do solid coloured metal panels. The woven wire mesh provided partial transparency. This is going to be the most visually dynamic building in the city. There’s nothing like it in North Florida." Crow adds: "Changing the building this way creates a more modern perspective of the hospital. The new façade will really grab people as they go by and make them want to come in. The colours make it attractive to children. It’s more cheerful, which can be part of a good memory."